FLEX is a strategy developed by the nuclear energy industry to implement the Nuclear Regulatory Commission (NRC)’s Fukushima task force recommendations quickly and effectively. FLEX addresses the main safety challenges at Fukushima—the loss of cooling capability and electrical power resulting from a severe natural event—to make U.S. facilities even safer. The strategy is “flexible” in that it relies on portable equipment to protect against even the most unlikely events — events that go beyond the plant’s design basis. FLEX is also site-specific to take into account the differences in the designs and the most likely risks at each nuclear energy facility. A flexible approach ensures that each plant can focus on planning for extreme events that have a greater probability of occurring locally. For example, the risk of floods is more likely in the Midwest, while earthquake risks are greater on the West Coast. The concept is based on the industry’s response after 9/11. Although the terrorist attacks had nothing to do with nuclear power, it led to a series of safety enhancements to guard against any type of extreme event. How will it work? What kind of equipment will be involved? FLEX will provide reliable backup electrical power and cooling capability if an extreme event disables multiple power and cooling systems at each reactor. One of the key lessons the industry has learned from previous events is that extreme natural disasters can damage and/or obstruct access to emergency equipment. Dispersing additional pumps, generators, battery banks, chargers, compressors and hoses among various locations will provide multiple redundancies to obtain power and water for the key safety functions of reactor cooling and used fuel pool cooling. To provide another layer of safety and ensure prolonged reliable operation, additional emergency equipment will be stationed in secure offsite support centers. FLEX addresses the key lessons from Fukushima on the need to maintain consistent supplies of electricity and water, even in the aftermath of unexpected natural events. The FLEX approach will also allow the industry to make post-Fukushima safety enhancements while the NRC develops regulations to codify them to ensure continued regulatory oversight. 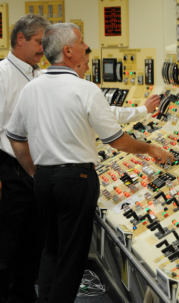 By working in tandem, NRC and the nuclear industry will ensure the maximum safety benefit in the shortest period of time. The Fukushima Response Steering Committee, a leadership structure formed to integrate and coordinate the industry’s ongoing response to the Fukushima Daiichi event, developed the FLEX concept. The committee—senior electric utility executives, reactor owners groups, the Nuclear Energy Institute, the Institute of Nuclear Power Operations (INPO) and the Electric Power Research Institute—spent the year following Fukushima ensuring that its lessons are fully understood and integrated into plans to enhance safety. Both the industry and the NRC have systematically reviewed the events for lessons and independently assessed areas to develop safety improvements at nuclear energy facilities. is enhancing the protection of used fuel storage pools. What else has the industry done in response to Fukushima? FLEX is just one part of a larger industry response that began almost immediately after the March 11, 2011, earthquake and tsunami in Japan. Within days of the events at Fukushima, the nuclear energy industry launched inspections and reviews of safety equipment and procedures at every U.S. nuclear energy facility. The industry’s self-evaluation and separate independent inspections by the NRC reaffirmed the safety of U.S. nuclear plants. Any issues identified during that process were quickly addressed. FLEX builds on those earlier steps by providing a swift, effective and efficient way to deploy additional plant emergency response and mitigation capability from the lessons learned from Japan’s experience. These additional safety enhancements are in keeping with the industry’s culture of safety, which includes on-going inspections, regular safety and emergency drills, intensive employee training and cooperation with government law enforcement and emergency agencies, as well as the independent NRC.